On the farm in Maryland by Katina Rogers licensed under Creative Commons. We don’t always think about agriculture in the context of urbanism, but it is an important part of our region. We should understand the role it plays, and how it too is impacted by things like zoning and sprawl. 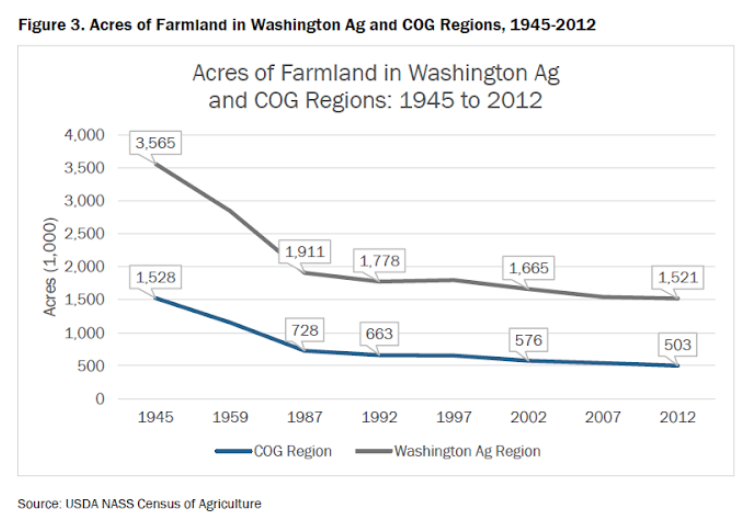 In a recent report, the Metropolitan Washington Coalition of Governments looks at the state of agriculture across the Washington region—in particular, its declining ability to be self-sufficient. Despite a growing interest in locally-sourced food, vineyards, and farmers markets, farms in our region are under pressure. 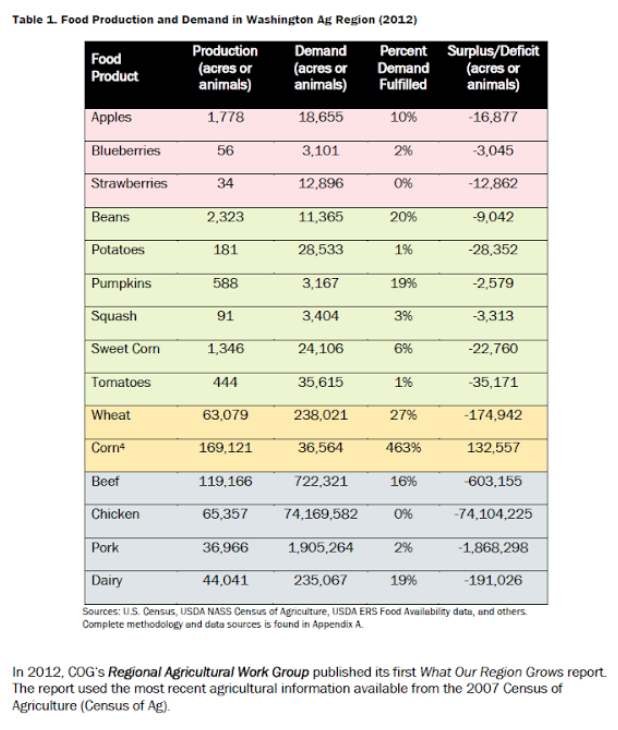 For decades, farm acreage has been declining, the report, titled What our region grows to eat and drink, shows. Although this trend has been slowing recently, food production is still decreasing. With a few exceptions, such as corn, the region does not produce enough food locally to meet demand. Prior to consolidation and other changes in the agriculture sector, parts of the region, such as the Delmarva Peninsula, were historically substantial producers of food. Today, farmers in our region face a number of challenges. For one, farming is a high-risk business with low profit margins. Second, the region’s farmers are aging rapidly. A number of the pressures on farms have direct connections to urbanism. High land prices in our region are a particular challenge for maintaining farm acreage. Land subdivisions can encroach on farmland, and once the farmland is developed, the soil is permanently ruined. Zoning restrictions also be limiting. For example, height restrictions can be a burden on farmers who want to build tall barns or silos to store grains. Other zoning ordinances restrict the size and hours of farm stands and how they can brew beer, and prevent them from processing meat, operating a creamery, and packing food. Many of the region’s jurisdictions are actively working to promote farming, however. The District of Columbia, Montgomery County, and Prince George’s County offer tax credits for urban farms. The report notes that Arlington even has 36 acres of farmland—all added since 2002. Urban farming, while on the rise, is not sufficient to meet the region’s growing food demand. Within the context of urbanism, perhaps the most important thing that the report touches on is the conflict between maintaining farms and increasing housing for people in a region badly crunched for homes. We need to prioritize both food and homes, and that's why (among many other reasons) urbanists argue so important to stop sprawl in our ever-growing metropolitan region and add density instead. Readers: What other interesting things did you discover in this report?